"I first saw The Paramounts in 1962 in a low-key hop in a Leigh-on-Sea community hall. At this time, most groups in the Southend area were playing the songs from the current hit parade as required in the local dance halls. However, this group was not churning out Bobby Vee or Shadows tunes; I was to hear strange songs about 'Peanut Butter' and about 'Three Cool Cats' intermingled with familiar, but unfashionable rockers gleaned from records by Jerry Lee Lewis and Little Richard. The group's line-up comprised the regular lead guitar, bass, and drums; but instead of the usual rhythm guitar, the vocalist was utilising the hall's old piano, a mike thrust into the top. Even more unusual was the small gathering of unofficial 'backing vocalists' clustered around the stage. Their chants were lending response to those opening shouts of the US Bonds song 'New Orleans'; their unison of wails constituted the chorus of that incredible song about 'Peanut Butter'. On asking one of the choristers about the band, I was informed that The Paramounts were resident at The Shades Cellar Club on Sunday nights." GARY BROOKER reminisces: "While still at school, I was in The Coasters with Johnny Short, and Brian Gill. Johnny Short was a master of the guitar, an absolute miracle worker! He could play a whole Carl Perkins record on guitar. He'd get the bass part, the rhythm, the lead, and the essence of the drum part as well. We played mainly instrumentals, and named ourselves after the US group The Coasters. I remember setting my piano on fire one night at Leigh Yacht Club. I left a cigarette on the end, and the celluloid on the keys caught fire and flared. The flames got up to A below middle C before I poured a pint over it!" "The Paramounts formed after a band contest at the Palace Hotel Dance Hall in Southend. At this contest, The Coasters competed with other local groups Micky Law And The Outlaws, The Raiders, Bob Scott And The Clansmen etc. Micky Law won the contest, and The Coasters came a close second, but this result was controversial because some people thought that Micky Law had fixed the votes, which were counted on slips of paper. Maybe Micky Law had more pencils than anybody else. The man who ran the contest was Peter Martin, a local entrepreneur. That night he conceived the idea of putting together a 'supergroup' from the cream of local musicians. He named the group The Paramounts, and later became their manager." "It appears that Peter Martin put the group together by dubious means. He'd already got Robin Trower and Chris Copping from The Raiders, Mick Brownlee on drums from The Outlaws, and Bob Scott on lead vocals. They wanted me on piano. Peter Martin got Rob to phone me and ask me if I could come to a rehearsal one Sunday, just to sit in and help out. I told him that The Coasters were playing that night. Rob said 'I've spoken to Johnny Short, it's O.K.' So I went to The Paramounts rehearsal, and the same thing occurred every Sunday for a month. Johnny Short assumed I no longer wanted to be in The Coasters, as I'd been missing rehearsals, I thought Johnny Short no longer wanted me, and suddenly I was a Paramount." "At The Paramounts rehearsals, it was mainly Carl Perkins numbers, and a few Cliff Richards. We did a lot of shows with Bob Scott singing lead, and our repertoire was dependent on what he wanted to sing, mainly Elvis and Rick Nelson. Bob failed to turn up to a gig one night, and the others said 'you sing'. I knew a lot of songs by Little Richard, Fats Domino, Chuck Berry etc. A guy called Sid was the local Chuck Berry man. He had a new Chuck Berry record the moment it was released. I would go to his house on the Friday night, he would already have the words written down, and we'd learn the song." "So I became the singer in The Paramounts, and we were all still at school. On leaving school, I went to Southend Municipal College to study zoology and botany. Robin worked with his brother cleaning windows. Mick Brownlee became a bricklayer, and Chris Copping stayed on at school to take his A-levels. It was around this time that Rob's dad bought The Penguin Cafe on Southend seafront, after The Penguin Cancer Scandal. The cafe's previous proprietor had been caught pocketing money from his Cancer Relief charity collection boxes. There were cellars below The Penguin Cafe, full of plastic penguins. It occurred to the Paramounts that this would be a good place to build a club, so we set about burning the penguins, painting the cellar, and building a stage. We bought a piano for 4 pounds, and opened up a month later, late in 1961, with a Sunday night show featuring The Paramounts. We called the club The Shades, after Johnny Harris And The Shades, a Southall group, who had recently made several impressive appearances in Southend. Shades was also a 'new word' for sunglasses." JOHN DENTON: "Early Sunday evening found me venturing past the arcades and stalls of Southend's famed Golden Mile, along the seafront road, towards Shoebury Garrison. I was soon to arrive at The Shades, which was one of several coffee bars then in vogue in Southend. The cellar club was run by the genial Len Trower. It cost me a shilling to descend into the dimly-lit cavernous room, formed of two dark areas fronted by a small dancing space and low stage. Behind the stage, a zany mural depicted The Paramounts' cartoon replicas. In the two back chambers, one could perceive youths sipping cola, while girls danced effortlessly to the juke box sound of 'Thumbin' A Ride'. The dance area was to fill as The Paramounts plugged in and commenced to rock. Egg boxers bedecked the ceiling, serving as primitive sound-proofing; the cluster of 'backing vocalist' fans was so effective in this environment despite the throbbing sound; the people around the stage were executing what would be termed The Pogo some fifteen years later. This was the most exciting music I'd ever heard." GARY BROOKER: "The Shades was a specialist club, catering for local record collectors, and R & B fans. Mods, rockers, and straightforward music fans co-existed without friction in the coke and hamburger atmosphere of the club. We extended our Sunday residency to include Wednesdays, and on the nights we didn't play we would go there to listen to either of the two well-stocked juke boxes. Most of the records in these two machines were the property of Tony Wilkinson, a local R & B collector, who helped to create The Paramounts early repertoire. One night, we discovered that Ray Charles, then on tour in Europe, was being broadcast live on French radio from the Paris Olympia. We got hold of a good radio set, plugged it into the amps, spread the word, and about 150 of us settled down in The Shades to listen to The Man." "A young chap named Kellogs used to frequent The Penguin, and later The Shades. Robin offered Kellogs a job as roadie for 4 pounds a week, and he ended up staying with us for years. People always had a roadie, even before the word was invented, Someone with a van who would drive the group, and before Kellogs time we had Greasy Johnny Bottle, who had a Dormobile, and knew a little bit about electronics. He built us a bass amp, made from a radio cabinet of course, which never worked. In his Dormobile, the manifold heated up, and nobody could sit anywhere near the engine. His party piece was to drive along Southend seafront towards the gasworks; he could get out of his window, whilst the van was moving, go over the roof, in the other side, and back to his driving wheel. It was uphill while he was doing it! Kellogs joined us just before we went on that long British tour – the one that lasted four years." "Around Christmas 1962 Chris Copping left the group to go to university. A guy called Diz Derrick replaced him. I had been in a group called The Electrics with him years earlier, skiffle days, and he had shown great musical ability at an early age. Also he was quite independent financially. He had the support of his dad – unlike the rest of us he had both a mum and dad –and if you said to him 'get a bass guitar', one would appear the following day. In all fairness, Diz supported The Paramounts quite a lot. Even in 1966, when we were nearly packing up, I can remember Diz telexing his dad from St. Tropez to send us down petrol money. Diz got a bass, and his dad put up the money to buy us a Commer van. We had Paramounts R & B painted on the back in gold letters!" "Towards the autumn of 1963 Mick Brownlee became disillusioned. The rest of us wanted to go professional. Mick wanted the security of his job as a bricklayer, and was also thinking of getting married. He left The Paramounts. There were no suitable replacements in Southend, so we advertised for a drummer in the Melody Maker. We got lots of replies, and held an audition in Orpington, Kent. Rob reckoned the best applicant was Barrie Wilson. He lived in Edmonton, North London. We gave him the job, and he moved to Southend, and lived at The Shades." "Wherever we played we made our reputation. We started to spread out in 1963 after playing a gig with The Rolling Stones. Both groups watched each other's sets. Until that point we didn't know that there were any other groups playing R & B! The Stones really liked us – they were still on the Chuck Berry, but we'd moved on to Bobby Bland and James Brown. We took over The Stones circuit playing all the R & B clubs in and around London. Previously we had been stuck in the Essex/Kent/Suffolk scene, but now there were other people who liked our music. By the time we turned professional we'd met up with Guy Stevens, who was The Man. All he ever did was listen to records! We'd go round his place once a week, and by the end of the evening we'd come out with ten new songs! He showed us a lot of obscure material like 'Chills And Fever', 'Mohair Sam', and 'Daddy Rolling Stone'." JOHN DENTON: "For several months I enthusiastically followed the path taken by The Paramounts, assimilating their ever-increasing repertoire, selected always with remarkable taste. The group journeyed through various phases as they, and I, discovered yet more of this special music which emanated from small American labels, and was subject to selective releasing in the UK"
"The next phase found the group moving towards Ray Charles ('Sticks And Stones' etc. ), and, slightly later, to the beautiful blues sound of Bobby Bland. This beloved rhythm and blues, which seemed to live only in the underground world of The Shades, was soon to burst into the national pop consciousness, as the first wave of Beatlemania hit in mid 1963. Suddenly everybody was singing 'Twist And Shout', or proclaiming 'Money, that's what I want'. As the beat boom soared, groups were springing up from everywhere in England to make records of our cherished R & B songs. The early Rolling Stones (who had visited The Shades to check out its esoteric juke box selection) brought everyone's attention to Chuck Berry and Bo Diddley. Chuck Berry's material was already well established in The Shades cellar. The Berry Sound well-suited Rob's pride and joy, his 'Country Gent', the first gold-plated Gretsch guitar in the country. I can well remember Gary, smacking at a tambourine, sitting on the piano stool singing 'Memphis, Tennessee', and also his struggle with the catalogue-styled words of 'No Money Down'." GARY BROOKER: "By this time we were playing a lot of air bases in the South East. Our set was all American rhythm and blues; we didn't play the Cliff Richard hits by this stage. lf somebody white sang a song it was an immediate no-no, with the exception of Bobby Darin, who had quite a lot of 'soul', and possibly a couple of Dion numbers. We were playing four to rave gigs a week. We'd get 30 pounds on a good night. At The Shades we got the door money – they charged one shilling admission. We had a stable line-up of Rob, Diz, Barrie, and me, and we went professional. Kellogs was roadie, but Diz drove the van. Our manager Peter Martin started thinking seriously about getting us a recording contract." "It wasn't our first attempt to get into records. We'd been up to London before with a woman from Leigh-on-Sea, who had a lot of money an eye for young fellas. She got us a session in London, but nothing came of it. Peter Martin said we had to make a demo. We recorded 'Poison Ivy' an 'Further on up the Road' at IBC Studio, with Glyn Johns engineering! Peter took it to Ron Richards at Parlophone. We were against recording a Coasters song, although we didn't mind playing them live. Peter Martin told us to record 'Poison Ivy'. I said 'that's sacred stuff". If we'd have had the choice, we wouldn't have made a record at all!" JOHN DENTON: In December 1963 came the release of The Paramounts' first single,'Poison Ivy'/ 'I Feel Good All Over'. TV promotion ensued and the record became a minor hit. Their second record 'Little Bitty Pretty One' is my favourite. This Bobby Day 'chant' song was so popular with the Shades fans. Diz's bass is particularly impressive on this cut. The flip-side was another regular item from the Shades songs, Ernie K-Doe's 'A Certain Girl'. The necessary introduction of the transportable Hohner Pianette was to take away a fair amount of the feel afforded by the old uprights, and this sound comes over clearly on The Paramounts' third record 'l'm The One Who Loves You', which was performed on the top TV programmes. It is noteworthy that the flip-side, 'It Won't Be Long', was written by Gary and Rob." GARY BROOKER: "We weren't aware that there was money in songwriting, until we came to record our third single 'I'm The One Who Loves You'. Ron Richards, our producer, asked us if we had any new material for the B-side. He suggested that we write one of our own. He said 'you'll get a little bit more money then'. We told him we'd never written any songs, but he insisted we have ago. Five minutes later we had written, and recorded, 'It won't Be Long'." JOHN DENTON: "Parlophone then made a limited issue of 'Bad Blood', a Coasters song culled from the Shades era, with double-tracked vocals. It was coupled with the Maurice Williams tune 'Do I'. Next came by far the group's most commercial record, an arrangement of Jackie de Shannon's 'Blue Ribbons' which, while hardly a showcase for the quintessential Paramount sound, compared favourably with the pop records in the chart at the time. The B-side, Johnny Watson's 'Cuttin In', gave Rob his first opportunity to play on record some of the guitar licks for which he was so admired at The Shades. The final recording to see the light of day was a song not of The Paramounts' own choosing. 'You Never Had It So Good', written by PF. Sloan, was coupled with a Brooker/Trower original 'Don't Ya Like My Love'. Of all the recorded releases, 'Don't Ya' came closest to demonstrating the true earthy quality of The Paramounts." GARY BROOKER: "'Bad Blood' was banned by the BBC because apparently bad blood is a euphemism for VD. 'Blue Ribbons' has the group way in the background with the strings an my vocal to the fore. It's like a solo vocalist's record. 'You've never had it so good' is a horrible record. I sang it, on purpose, in a horrible way, a bit like Barry McGuire. The B-side, 'Don't ya like my love' is probably the best record we ever made." "There was a period in 1965, when Barrie temporarily left the group to pursue a gambling career in the South of France. It was during a brief stint when we backed Sandie Shaw, and we got Phil Wainman in on drums. Wainman subsequently went on to become a successful record producer." "When our repertoire was no longer sacred, we jacked it in. By early 1966, I became disillusioned myself, and started writing my own songs. You see, you could play at The Scotch, and perform a song, and five minutes later they'd play the record, and wipe you off the floor That couldn't have happened in earlier days, because ONLY GUY STEVENS HAD THE RECORD!" "'Freedom' was recorded at Abbey Road in July 1966.I was listening to Art Blakey, smoking a lot of hashish, and thinking about Charlie Mingus. Before the session, we went round to a friend's flat in Abbey Road, and took a load of pills. We invited about twenty of our friends up from Southend, such as Dave Munday, John Lewis, and Cliff Bennett, not the singer, the sock-picker. He used to wear incredible mohair suits. He was a very nervous guy who all the time picked imaginary fluff off his clothes. It was still a quick three-hour session, I can't imagine how we got away with it! Ron Richards was still in the chair, but we thought nothing of taking twenty stalwarts to the studio to sing backing vocals. I remember running from the piano to the organ for the solo in 'Freedom', and tripping up. If you listen carefully, you can hear it on the record"
JOHN DENTON: "The Paramounts eventually disbanded somewhat discouraged and disillusioned. Of course, the story does not end there. Gary Brooker was soon to re-emerge with one of the biggest-selling pop records of all time, Procol Harum's 'Whiter Shade Of Pale'. Procol Harum was soon to embrace ex-Paramounts Robin Trower and Barrie Wilson in their line-up. Indeed, one incarnation of the group comprised a total Paramount complement with Chris Copping, their early bass player, rejoining his Southend buddies. Robin Trower was, of course, to achieve enormous popularity (especially in the USA) with his own band, and a series of best selling albums. To me, The Paramounts played the best R & B I have ever heard from a British band. 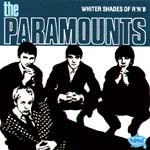 As with other Beat Boom recordings, The Paramounts' records should not be compared with the original American R & B and soul tracks of the day. However, they delivered their interpretations of these songs with consummate sincerity and taste, and were excellent pioneers of the R & B genre in this country. The picture of Gary, mike stand between his legs, playing that old upright with its Selmer Tru-Voice pick-ups, the static Rob Trower bent lovingly over his Gretsch and playing the perfect solos, the lean Diz gazing impassively, while giving out walking talking bass, and the youthful BJ Wilson keenly mastering his grey Ludwig set, is unforgettable. These recordings serve as a fine reminder of that period in 1963/65 before rock music started to take itself seriously." GARY BROOKER: "The last thing we wanted was to be a commercial success. Our records were so unrepresentative of the group, but there's no choice, because the other bit went on the night We breezed along believing in what we were doing, until suddenly we realized we weren't doing what we believed in! We came upon a situation where our repertoire was, in fact, available in every disco in town – it hadn't always been that way. Otis Redding had come from being a sort of underground artist, to becoming a public property. Suddenly it wasn't ON any more. We'd lost the exclusivity of repertoire we'd enjoyed in previous years." Click here for the track-listing on the record from which these notes come.